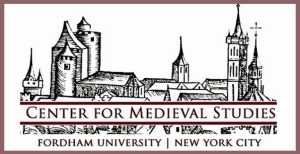 Since 1980, the Center for Medieval Studies at Fordham University has hosted an annual interdisciplinary conference on a different theme each year. These conference vary in length from one to four days, but generally occur over a weekend in March and attract more than 150 participants from all over the globe. A number of our conferences have been co-sponsored with other scholarly groups, including three conferences with the Centre for Medieval Studies at the University of York (2012, 2007, and 2005), and others with the New Chaucer Society (2006), and the Medieval Academy of America (2002). Selected papers from several past conferences have been published; some of the most recent are: Reading and Writing in Medieval England: Essays in Honour of Mary C. Erler, edited by Martin Chase and Maryanne Kowaleski (Boydell and Brewer, forthcoming); Thinking Medieval Romance, edited by Katherine C. Little and Nicola McDonald (Oxford University Press, forthcoming); The French of Outremer: Communities and Communications in the Crusading Mediterranean, edited by Laura K. Morreale and Nicholas Paul (Fordham University Press, 2018); and Eddic, Skaldic and Beyond: Poetic Variety in Medieval Iceland and Norway, edited by Martin Chase (Fordham University Press, 2014). The Center also sponsors occasional symposia, including Textual Interpretation in the Medieval Vernaculars (2012), a Symposium on Skaldic Poetry (2011), and Challenging the Myths of Art History: A Symposium in Honor of Linda Seidel (2011). We also regularly co-sponsor other conferences apart from our annual spring conference.